Why to rely on SysTools? 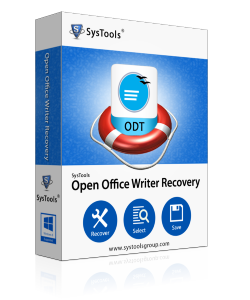 You can use SysTools Open Office Writer Recovery software to repair damage Open Office file. Have a look on what our software can do for you? Using this repair ODT document solution, you can easily read corrupt Writer (.odt) files and can recover ODT files along with all element like text, images, image objects, hyperlinks, Unicode characters, tables, text formatting, page headers and footers, page orientations and every other style and formatting included in the Writer document (.odt) files. If you are unable to read damage ODT database, then after recovery process you can easily and quickly access healthy ODT database. You can save ODT file after corruption and can save your corrupt .ODT files into a new .ODT or .RTF files which has opened with Microsoft Word. This software aims at performing high and advanced technology and at the same time ease giving.